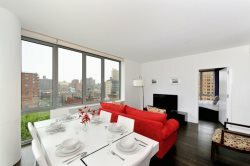 Stay on Manhattan's Upper West Side in this stunning and sophisticated two bedroom two bathroom apartment. Located on the 10th floor of a luxury elevator building with an on-site gym and outdoor garden with lounge seats. Convenient features like standard kitchen appliances, dining table and flat screen cable TV in apartment. Stunning city views that you can enjoy with floor to ceiling windows.